This book is the latest in a series that has been around for almost thirty years. I've been buying them for all that time, starting with Sword-Dancer, published in 1986. In that book, a unique fantasy world was introduced, and two unforgettable characters in Tiger and Del. The author has done a marvelous job with Tiger's voice; the rhythms and cadences, and snarky humor, are unmistakably his. It's a credit to her that his voice remains unchanged after all these years. Tiger has grown considerably throughout the series, however, as has Del. In the beginning, Tiger is quite frankly a male chauvinist pig, the usual type for a desert fantasy world. Del successfully changes his mind and makes him view and treat women as people, a process that is still ongoing. 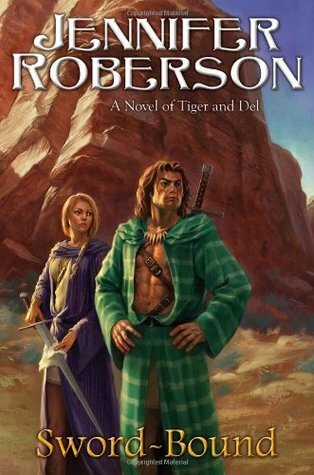 There's a strong feminist streak that runs throughout the series, especially in the fifth book, Sword-Born, where Tiger tells Del to “go where you wish to go, be who you wish to be,” even if that means leaving him. Del replies that being with him is where she wishes to be, and in this, the seventh book of the series, they are still together. Two talented, damaged people, who have been through hell and back, each nearly killing the other; and here they are, their loyalty, partnership and love still going strong. Things have changed, though. They have a daughter now (Del miscarries another child in this book), and both have matured. Tiger is content with his life and his family, and Del is no longer so bent on revenge. These characters have a rare depth, and they are absolutely on target. I couldn't say the same about the plot, unfortunately; it tended to flail and meander for the first two-thirds of the book, although my fascination with the characters more than made up for that. The climax came quite suddenly, almost out of the blue, although I'm sure when I reread the book I'll see where the clues were planted. Nevertheless, this does seem like a rather unpleasant reversal to the overall storyline. Tiger was finally able to live his life, free from wizards and magic, and now he's being sucked back into it again? Well, I guess I'll have to read the next book to find out, won't I? One note about the covers. I know authors usually have no say in the covers and cover models, but good heavens, I wish Jennifer Roberson could have done something about this cover model. He is spectacularly unattractive, with a peculiar cube-shaped face. Not how I see Tiger at all. The series' second book, Sword-Singer, shows what I consider to be the real Tiger (who happens to look a lot like Patrick Swayze). Never mind, ignore this cover, and revel in these characters and this world. Sign into Goodreads to see if any of your friends have read Sword-Bound.